It was on this day in 2004 that ex-NFL player turned soldier, Pat Tillman, was killed by friendly fire in the mountains of Afghanistan. Tillman joined the United States Army Rangers in May of 2002 in the aftermath of the September 11 attacks. Pat Tillman attended the Arizona State University, where he excelled as a linebacker despite his relatively small stature for that position. He was drafted in 1998 by the Arizona Cardinals and moved to the safety position for his rookie season, where he started ten out of the sixteen games. After completing his fourth season in the NFL, Tillman turned down a contract offer of $3.6 million over three years from the Cardinals to enlist in the U.S. army. 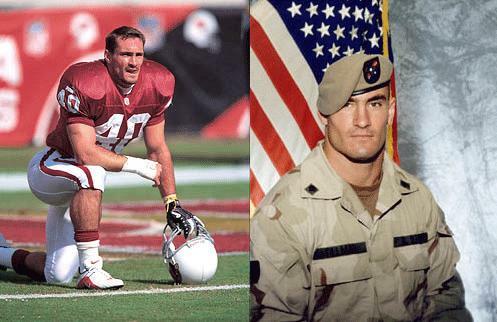 Pat Tillman was a young man getting paid millions of dollars to play a game that he loved and he left it all behind to serve his country. If that is not the definition of courage, bravery, loyalty, and patriotism, then I don’t know what is.